I have been so busy lately I haven’t had a proper time to do my devotions. I hope you all will forgive me for taking so long to get back to the book of John. Do you remember last time we met we talked about how pivotal love was? Today we make our way in John 15, the first seventeen verses. 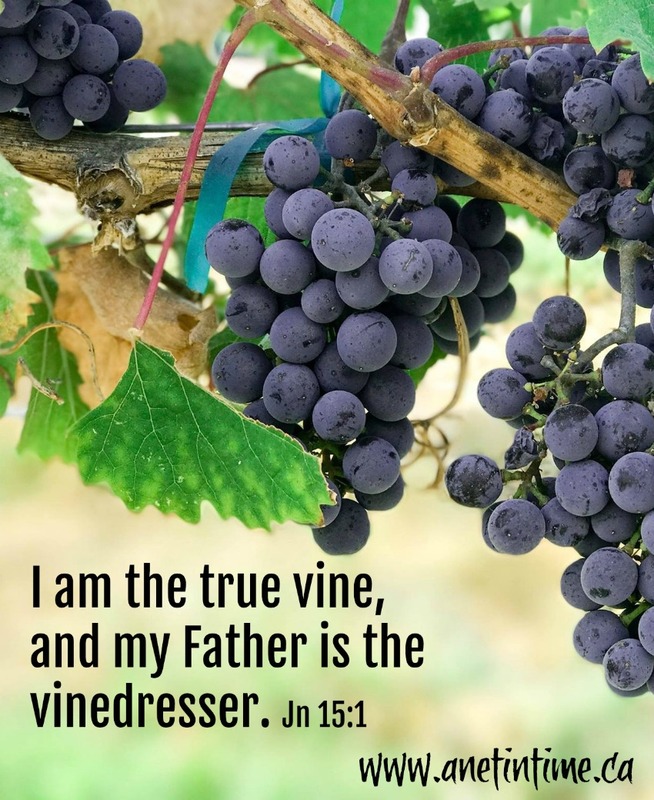 “I am the true vine, and my Father is the vinedresser. 2 Every branch in me that does not bear fruit he takes away, and every branch that does bear fruit he prunes, that it may bear more fruit. 3 Already you are clean because of the word that I have spoken to you. 4 Abide in me, and I in you. As the branch cannot bear fruit by itself, unless it abides in the vine, neither can you, unless you abide in me. 5 I am the vine; you are the branches. Whoever abides in me and I in him, he it is that bears much fruit, for apart from me you can do nothing. 6 If anyone does not abide in me he is thrown away like a branch and withers; and the branches are gathered, thrown into the fire, and burned. 7 If you abide in me, and my words abide in you, ask whatever you wish, and it will be done for you. 8 By this my Father is glorified, that you bear much fruit and so prove to be my disciples. 9 As the Father has loved me, so have I loved you. Abide in my love. 10 If you keep my commandments, you will abide in my love, just as I have kept my Father’s commandments and abide in his love. 11 These things I have spoken to you, that my joy may be in you, and that your joy may be full. 12 “This is my commandment, that you love one another as I have loved you. 13 Greater love has no one than this, that someone lay down his life for his friends. 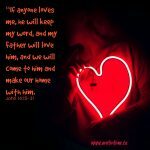 14 You are my friends if you do what I command you.15 No longer do I call you servants, for the servant does not know what his master is doing; but I have called you friends, for all that I have heard from my Father I have made known to you. 16 You did not choose me, but I chose you and appointed you that you should go and bear fruit and that your fruit should abide, so that whatever you ask the Father in my name, he may give it to you. 17 These things I command you, so that you will love one another. Jesus is talking with his disciples, he had just reminded them of how pivotal love was. How our love is shown in our obedience and the connection that makes between God and the Son. Jesus paints a picture for them. Jesus is the vine, God is the vinedresser. If you have a vine with unproductive parts you remove them. It’s makes the whole plant stronger to remove those unproductive parts and it keeps the plant healthy. I know this from my work in my garden… if I have a plant with spindly bits…you remove those. If a part of a plant is non-productive you cut it away. But… and I find this such a curious thing with my tomato plants… if I have a branch that is productive…I trim it just a bit and this surprising thing happens… it bears healthier, bigger fruit! Go figure. God’s word tells me this truth though. “every branch that does bear fruit he prunes, that it may bear more fruit”. Anyways, you get the point, Jesus is the vine that fruit comes off of. God is the one that keeps the vine (and therefore it’s productivity) healthy and productive. The disciples are clean because of the words spoken to them, so Jesus reminds them.. Abide in me, and I in you. To make sure the disciples really understand he reminds them that a branch can’t bear fruit in isolation and neither can we. We need to abide with Christ. To abide means (for those curious) to live with, to accept, to remain with, to continue with and to act in accordance with. We need to do this if we are to bear fruit. This abiding that we do leads to us bearing much fruit… to have something result in the course of our being. What that fruit is for each of us will differ as we are called to different tasks but we won’t have it if we don’t live in accordance to God’s will. If we don’t bear fruit (which is the result of not remaining with Jesus), we become useless and useless things get thrown in the fire. If anyone does not abide in me he is thrown away like a branch and withers; and the branches are gathered, thrown into the fire, and burned. Not only do we have the benefit of being productive if we actively live with Jesus, we also have this benefit. If you abide in me, and my words abide in you, ask whatever you wish, and it will be done for you. Isn’t that just cool? To know that Jesus is so on our side, the God is the great overseer that if we need something and ask for it…. we get it. Easy peasey eh? By doing this God (the Father) is glorified. The more fruit we provide, the more we show we are his disciples. The more we show forth God’s love, Jesus’ love for us to others. Awesome sauce eh? Jesus ties it all together for us doesn’t her? As the Father has loved me, so have I loved you. Abide in my love. 10 If you keep my commandments, you will abide in my love, just as I have kept my Father’s commandments and abide in his love. 11 These things I have spoken to you, that my joy may be in you, and that your joy may be full. Our obedience is a joy to the Lord God. Our obedience shows our love and it shows that we are living within Jesus’ love for us. Furthering this thought Jesus goes on to tell the disciples: “This is my commandment, that you love one another as I have loved you. This action… to love one another as Christ has loved us. Can you imagine what would happen if we actually all did that? Loved each others as much as Christ loved us. That’s a love that lays down a life to save another. Can you say you love me like that? Can I say I love you like that? Oh, that’s a hard one isn’t it? But listen, Jesus calls us his friends if we do what he commands. Can you imagine that! Being called a friend of Jesus. Moses was a friend of God. Paul a friend of Jesus. That’s a good couple of people to join yes? Friends, not servants. There’s a difference you know? Friends, serving, obeying out of love. Not out of payment or duty, but out of love. These last lines… oh.. they are lines of comfort eh? You did not choose me, but I chose you and appointed you that you should go and bear fruit and that your fruit should abide, so that whatever you ask the Father in my name, he may give it to you. 17 These things I command you, so that you will love one another. Oh do you see the comfort in these lines. GOD chose me. Not me him, he chose me. He, the one who is unchanging, unfailable, omnipotent, GOD. HE chose me. And then he appointed me to be a bearer of fruit. He chose YOU to be a bearer of fruit. This choice was made, so don’t be afraid to ask for you needs. The one who chose you will supply them. Therefore love each other as you have been commanded. The one who chose you, who chose me, the one who loves us deeply and dearly has commanded it of us.